Populating your first saltwater tank can be quite a challenge. You do not want to buy a fish that will be too difficult, to begin with, and you likely do not want lackluster fish that will hang around in your tank, taking up space, and sucking up food. 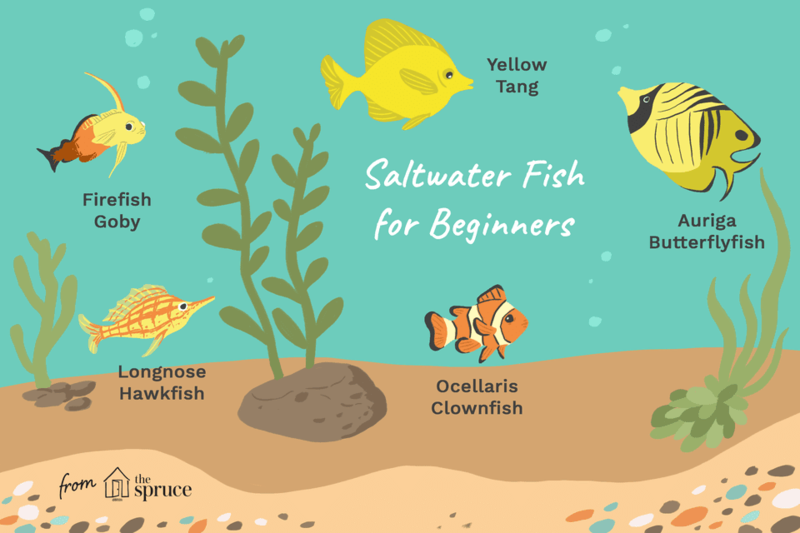 A saltwater aquarium fish compatibility chart will give you an idea of which fish may have a better chance of existing together in a closed space. In many cases, the chart indicates which will coexist with a certain amount of caution. Nothing is guaranteed. There will always be exceptions to any generalization, but the chart will give you a place to start when you are trying to figure out what will work in your aquarium. One peculiarity of this clownfish is that, even when placed in a large aquarium, once it has established its territory, it will seldom stray from that area. If it makes its home in one corner of a 4-foot wide tank, it will rarely be seen at the other end of the tank. Tank raised specimens (highly recommended) of this species are fairly easy to find and, if a young pair is purchased, they will easily become a mated pair, without much of the mating ritual abuse experienced with other species of clownfish. Also, being tank raised, they are accustomed to eating hand-fed foods and acclimate very well. The colorful coral beauty angelfish, also commonly called the two-spined angelfish, is a popular dwarf angelfish which acclimates easily to aquarium life. Scientific called Centropyge bispinosus; it is a favorite species for aquariums due to its brilliant colors, hardiness, low price, and ready availability. This fish is normally not as aggressive as many other angelfish, but some individual specimens may be territorial in smaller aquariums, particularly if they have been in the tank for a while. The flame angelfish also called a Japanese pygmy angelfish, is considered one of the best choices for aquariums because it usually adapts well to captivity. It is best kept singly or in mated pairs, and with other less-aggressive fish. Although touted to be a fairly good reef safe fish, it may nip at large polyped stony corals, zoanthids, tridacnid clam mantles, and even some soft coral polyps. Therefore, this fish cannot be completely trusted if these invertebrates are present. The lawnmower blenny is also known as the algae blenny, jeweled rockskipper blenny, sailfin blenny, jeweled blenny, and rock blenny. This blenny is a great algae eater which is a benefit to any saltwater aquarium. New tanks tend to grow a lot of algae as the nitrate levels rise. The lawnmower blenny helps keep the algae, particularly green hair algae, in check as the tank matures. The major hurdle for this fish is to get it to eat tank foods. It is important to observe the fish eating before buying it. Offering the fish frozen mysis shrimp seems to help them get started. Also, if other fish in the tank are eating certain foods, the auriga seems to pick up on the fact that the food is edible. Like it's cousin, the auriga butterflyfish, a major hurdle for this fish is to get it to eat tank foods. Observe the fish eating in a tank before buying it. Frozen mysis shrimp is a good go-to for feeding in the tank. The ocellaris clownfish is often confused with the percula clownfish. Unless you are experienced with both fish, they are difficult to tell apart. The true percula is very bright orange, whereas, the ocellaris tends to be more drably colored. The percula clownfish also has a thicker black outline to its white body stripes. Their beautiful colors and likable personalities make them a wonderful addition to reef aquariums. Even though the blue-green reef chromis (Chromis viridis) belongs to the damselfish family, unlike its damsel cousins, it seems to get along with almost any non-aggressive fish. It also does not bother corals or other invertebrates. The blue-green chromis readily eat tank foods and adapt to tank life very well. The yellowtail damselfish seems to get along with most non-aggressive fish. The yellowtail damselfish is a favorite of aquarium hobbyists since it is extremely hardy and gorgeously colored. Unlike other damselfish, it usually leaves corals or other invertebrates alone. The yellowtail damselfish readily eats tank fed foods and adapts to tank life very well. The firefish, scientifically called Nemateleotris magnifica, is a very docile fish. It should be kept singly unless the tank is very large, or it is put into the tank as part of a mated pair. This fish is very timid and will not come out of hiding unless it feels secure. The firefish is also known to leap from a tank when startled, so a covered tank is best. The orange-spotted goby (Amblyeleotris guttata) spends its time gobbling sand and spitting it out through its gills, sifting food as it goes. This is a great little sand sifter which will keep your substrate free of uneaten food and other debris. Its diet should be supplemented with a variety of live and frozen brine shrimp, mysis shrimp, live black worms, and prepared foods for carnivores. The sleeper-banded goby uses shallow burrows in the substrate as a refuge, keeping the substrate well oxygenated. It is rarely aggressive towards other fish. However, it is territorial and will fight with others of the same species unless they are a mated pair. Like most gobies, this fish is known to jump out of uncovered aquariums. Like other gobies, the diamond watchman goby or watchman goby stirs the sand as it sifts through it, straining out food. These fish will typically clean out the sand bed, removing any microfauna, copepods, and beneficial bacteria that the tank may need. While the diamond watchman goby is peaceful and should not harm any other fish, they can become territorial when paired with similar sand sifters. Rarely aggressive towards other fish. However, it is territorial and will fight with others of the same species unless they are a mated pair. This goby will also jump out of a tank, so a tight-fitting lid is recommended. This fish should be fed a variety of foods, including fresh or frozen mysid shrimp, enriched brine shrimp, finely chopped table shrimp, and frozen foods for carnivores. This fish should be fed at least twice per day. This flame hawkfish's vibrant red color, personable nature, and small size makes it a highly sought after specimen by hobbyists. However, like most hawkfish, it is a predatory bottom-dweller. It likes to sit on top of rocks or corals to keep watch, ready to pounce on any unsuspecting prey that swims too close. In a reef tank, this fish will most likely take up residence in a hard coral head, perching on top when at ease, and darting down inside the coral head when threatened. It may also take up refuge next to the base or under the tentacles of a large magnificent/ritteri anemone. The flame hawkfish gets along fairly well with other fish but may act aggressively towards other bottom-dwelling species. In a small aquarium this may present a problem, so either avoid other bottom-dwellers or provide this fish with plenty of room and hiding places to ease territorial conflicts. The longnose hawkfish can be kept in male and female pairs but should be introduced to the tank at the same time. This fish is well known for jumping out of uncovered tanks, so cover your tank with a canopy. The spines of the volitan contain a powerful toxin which can cause a very painful or fatal sting if you are allergic. Handle this fish with great caution. It should be noted that if the volitan does sting something in its tank, the poison released into the water can be fatal to other fish and invertebrates. Commonly recognized as the fish "Dory" in the movie, "Finding Nemo," the blue tang (Paracanthurus hepatus) is not overly aggressive towards other tank mates but may become boisterous in the community. Juveniles can be kept together in groups, but adults will fight unless ample shelter and swimming room are provided. This species is prone to contracting the fish disease, ich, and is susceptible to head and lateral line erosion like most surgeonfish are. Unlike most tangs or surgeonfish that require a steady diet of algae, the Pacific blue tang should also be fed meaty fares to satisfy its zooplankton dietary needs. Finely chopped fresh or frozen shrimp, mysid shrimp, brine shrimp, and preparations for herbivores are suitable foods, as well as nori (dried seaweed) is accepted. The yellow tang (Zebrasoma flavescens) is one of the most popular fish for a saltwater aquarium. In general, this fish gets along well with other fish in an aquarium, but it can be aggressive towards other yellow tangs and surgeonfish if they are not introduced into the aquarium at the same time. If your tank size allows you to include several of these fish, you will be entertained by their lazy "follow the leader" patterns in and through your tank's rock structures. The naso tang (Naso lituratus) is a fish which, once adjusted to aquarium life, has a great personality. It can be trained to eat food right out of your hand. It is one of the more aggressive surgeonfish species when it comes to territorial disputes with other surgeonfish, especially of its kind, but generally will get along with other fish tank mates and invertebrates. It is interesting that they will attack each other considering that in the wild they tend to congregate in small groups or schools. The kole yellow eye tang (Ctenochaetus strigosus) spends its day constantly grazing and eating, so provide it with an environment that has plenty of algae. However, do not put one in a small reef tank, as it can do a lot of damage if you have delicate plants and algae growth that you want to keep. In a very large reef tank, the plant growth can recover, as the kole has so much to pick from. The kole tang adapts to tank food well. It likes nori (dried seaweed), flake foods made from dried marine algae, and will nibble on some meaty foods like dried shrimp and blood worms. In the wild, each Niger triggerfish (Odonus niger) has its own house to live in as part of the coral and rock formations just outside the reef. They emerge and congregate near the surface of the water in large schools to feed on zooplankton and algae drifting along the current. In a closed environment with other Niger triggerfish, they will bite and attack each other. This is a fish that can be aggressive towards more docile fish and tank inhabitants. This wrasse does not bury in the sand to sleep at night but will lay on top of the substrate or take refuge in rocks. It is a flighty fish that will leap out of an open aquarium, is constantly on the move, and needs lots of swimming room. The eightline wrasse is shy at first, but once it gets used to being in an aquarium, it becomes bolder and will take food out of your hand. The eight-lined wrasse, so named for the eight stripes along the sides of its body, likes to hide, so be sure to give it plenty of cover. Like most wrasses, the eight-lined wrasse likes to burrow under the sand or substrate in your tank as a means of sleeping and protection. Be sure to keep the substrate clean. It is a fish that can pick up bacterial diseases both internal and external easily. The four-lined wrasse (Pseudocheilinus tetrataenia) is a smaller species, which does better in a less belligerent tank but may act aggressively toward more peaceful wrasses and other small fish. Given the right cover, it will spend a lot of its time hiding and foraging for small snails, worms, and crustacean in live rock. Like most wrasses, the elegant wrasse likes to burrow under the sand or substrate in your tank as a means of sleeping and protection. Keep the sand clean for them. Wrasses can pick up internal and external bacterial diseases easily. As with most wrasses, the ornate wrasse buries itself in the sand when frightened or while sleeping at night for protection. Distinctive for their stunning coloration, the beautifully ornamented Christmas wrasse from Fiji is also known in the hobby trade as the red-lined or biocellate wrasse. It is a non-aggressive species that is compatible with other fish and is safe with corals but can be a threat to fan worms, small hermit crabs, snails, and ornamental shrimp.